Welcome to the BBC Proms 2017. Marking their 90th anniversary, the Proms continues to pursue Henry Wood’s founding principles and present classical music to the widest possible audience with celebrated international artists, orchestras and conductors. The annual summer festival has its devoted followers and ‘prommers’ rounding up early in the afternoon, just before the big event. And with standing tickets worth £6 only, who could blame them. Proms 3 was an afternoon concert focused on works by Mozart and Schumann. Dutch conductor Bernard Haitink made his 89th performance at the Proms with the Chamber Orchestra of Europe. The conductor looked dashing and in good shape for 88-years-old and, it should be noted, the choice of works for the concert’s programme weren’t quick, hit and run-type pieces. In fact, the first half was no more than an hour long with two fascinating works by Mozart, and Haitink wasn’t taking any survivors. Not literally, of course. As presentation goes the Royal Albert Hall got professionalism at its best with fine and squeaky clean music-playing from the Chamber Orchestra of Europe. The relentless and highly-spirited playing was visible throughout the concert – we have to thank the energy and sheer force of Mozartian conductor, Haitink, for that. Mozart’s ‘Prague’ Symphony No. 38 is quite autobiographical of the composer. He wrote it just after the time he had moved to Vienna from Salzburg in 1781. It was the city of Prague that commissioned the young composer to write his glorious opera Don Giovanni, and in the opening of the first movement of his Prague symphony, those pronounced minor-keys are the same keys used for the final act where the Don comes face-to-face with his arch nemesis, the Commendatore. Haitink paced the Chamber Orchestra and didn’t push them overboard, yet for what the first movement is, there are no special moments of climax, but a steady flow of stylish music which some argue to be emotionally complex and ambiguous music. The second movement had the Chamber Orchestra slightly more relaxed with a hop and skip away from something other than the slightly ominous-sounding first movement. Perhaps it was Mozart’s way of transitioning from the first movement to the final ‘Presto’ movement filled with jovial punches, as well as light bursts of joy and cheerfulness. Haitink guided the musicians to be louder here. The solo woodwinds (flute and clarinet) got the chance to sing like birds among the sea of string instruments. It was interesting to watch them all, collaboratively, go at it with a hard, floor-shaking ending. 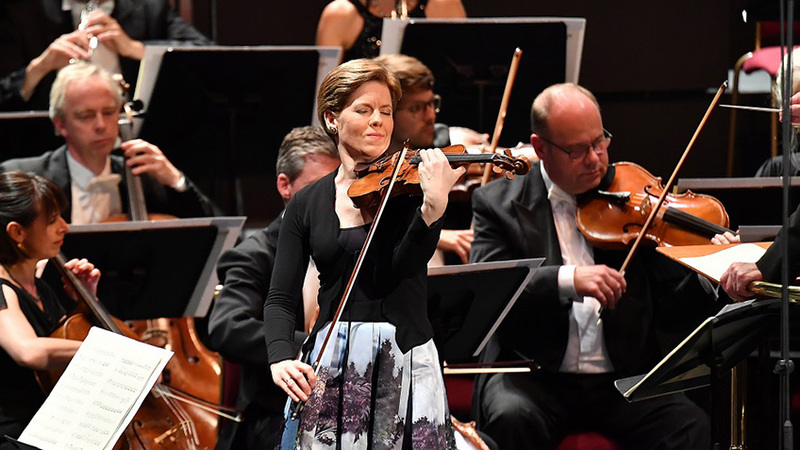 Isabelle Faust was the solo violinist to sparkle for Mozart’s Violin Concerto No. 3. Previously she had performed as a member of the Chamber Orchestra of Europe, so it was no surprise that her playing was nicely primed for an orchestra she was intimately familiar with. Flaunting a long, puffy skirt with imagery of spring flowers and the green, Faust had set our scene for what would be a delicate and thrilling performance. The 19-year-old composer showed unique signs of expressiveness and lyricism as the piano and violin virtuoso that he was. Faust encapsulated this by showing us that anyone who wanted to play the piece right needed to be a genuine performing artist. Faust moved dynamically, particularly in the Allegro, and held back when she needed to. In those quick-witted moments when it felt like she was playing super fast, she didn’t perform it as if there was a race to be the fastest performing musician. In fact, her playing was tightly held down with artistry and smart timing. The real eye-watering section was the second movement. If Einstein was alive today, he would congratulate Faust for performing Mozart’s Adagio (second movement) as good as he had heard it, ‘fallen straight from heaven.’ This was beautifully entwined with soft flute-playing and melodic strings. Her Rondeau finale was also memorable for her brisk and light-hearted pizzicatos, as well as her cadenza with pianist Andreas Staier. For the second part of the concert, the mood was almost the polar opposite. Schumann suffered from chronic depression, and his Symphony No. 2 bears all, his mental health and day-to-day struggles since 1844. For what would seem to be a graver piece describing the darker period of Schumann’s life, Haitink kept the music interesting and hopeful. The Chamber Orchestra of Europe performed to an upbeat tempo and maintained an optimistic rhythm, enough to keep the Royal Albert Hall engaged and feel for the composer’s condition at the time he was composing the symphony. The Scherzo and the trio section were enthusiastically performed and characteristic. When it came to the slower movement, again at the Adagios, the Chamber Orchestra showed their ability to play for any style, movement and feeling. This was also the case when the symphony rounded up with a robust finale. The Chamber Orchestra played Schumann’s music with deep reflection and wonder, but it didn’t end there. Even if Haitink was worn-out at this point (two hours in), he didn’t stop. He ended the concert with a bonus – the Scherzo from Mendelssohn’s A Midsummer Night’s Dream. The man is unstoppable.